Enjoy shopping with printable coupon at Canadian The Children’s Place stores. 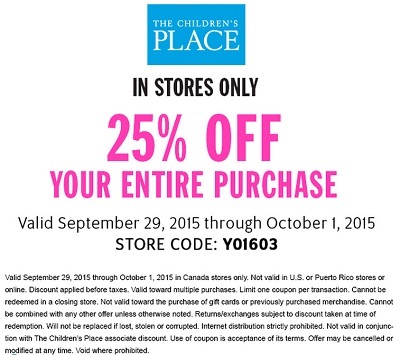 Print the coupon, visit your nearest Canadian The Children’s Place store and take 25% off your entire purchase. Offer ends 10/01/2015. Official source of the information is The Children’s Place Canada. More information about the promotion available at Canadian stores.